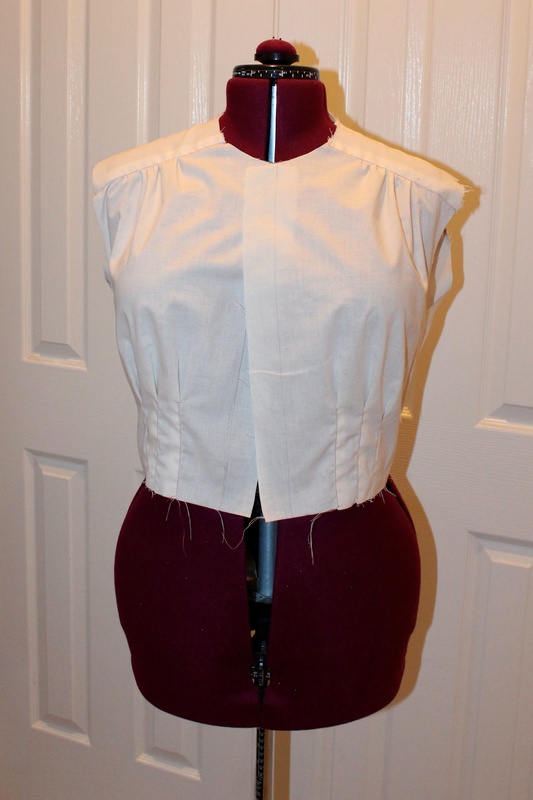 I had high hopes that I could translate all my recent experience in fitting my bust into a version of Sew Liberated’s Schoolhouse Tunic that would NOT look like a maternity top. Alas, either my skills are not yet up to snuff, or this pattern was not a great choice for my figure. Probably both. But I did try out some new techniques on my muslin that I’m eager to use again. Ugh. My attempt at a full-bust adjustment screwed up the proportions of this pattern. 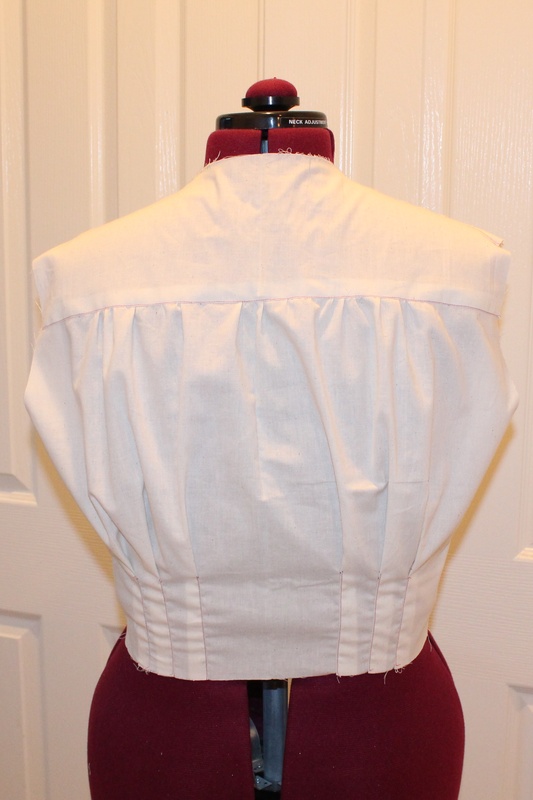 I had to lengthen the part above the bust seam to lower the bust point. I also opted for gathers instead of a dart, which was a mistake. I thought of soldiering on, but I came to the conclusion that a seam just below the bust will not work on my figure unless the area below the seam is fitted, which is not the case with this pattern. So disappointing! It’s such a cute pattern. The “muslin” was half of an old sheet. At least I think it was a sheet no longer in use. I couldn’t find any holes or stains or other signs of being worn out, but it was near my fabric stash, so I think I had relegated it to the “use for a muslin” pile. Too late now! I still have half the sheet to use for something else. 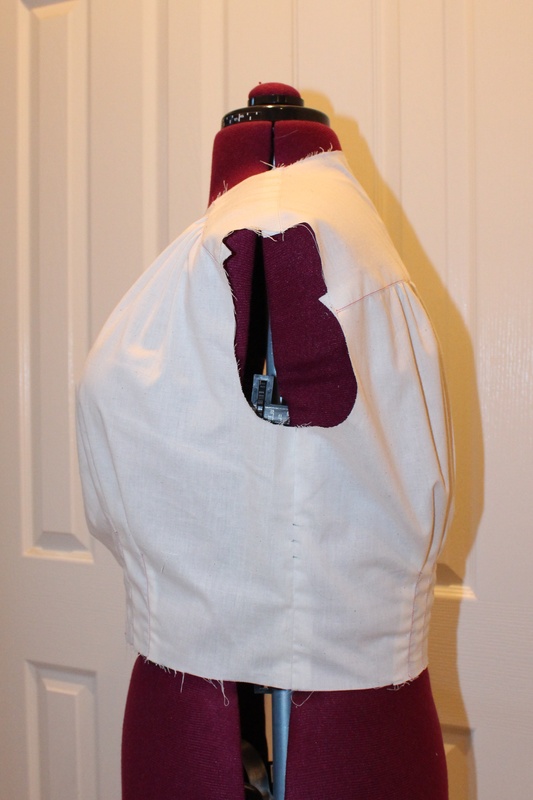 Although the tunic didn’t work out, I do think my idea to reverse the placket to the front was a good one. 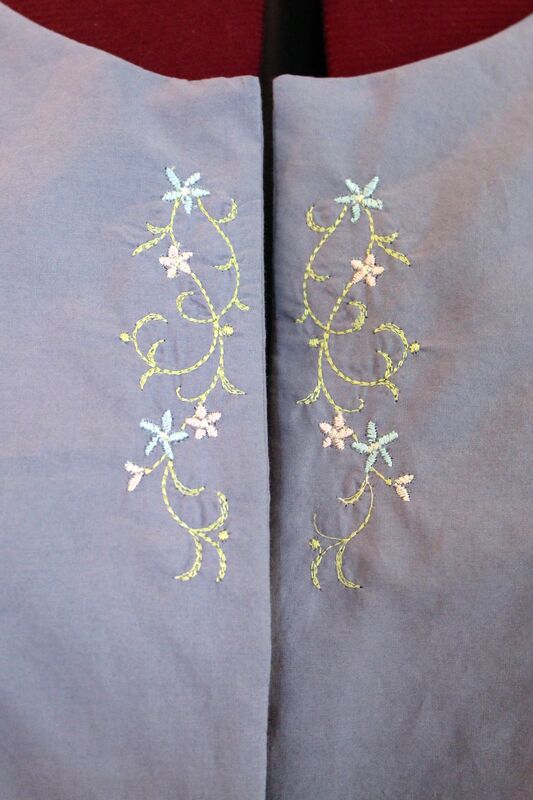 The placket looks really good, anyway. Small victories. Oh well, the good news is I tried a flat-felled seam for the first time, and I love the technique! I want to make a shirt for my husband (the sleeves on ready-to-wear are always too long for him), so I investigated the shirts in his closet. Flat-felled seams everywhere! I thought I’d better try one before I make him a shirt. And so I did. And it was awesome! 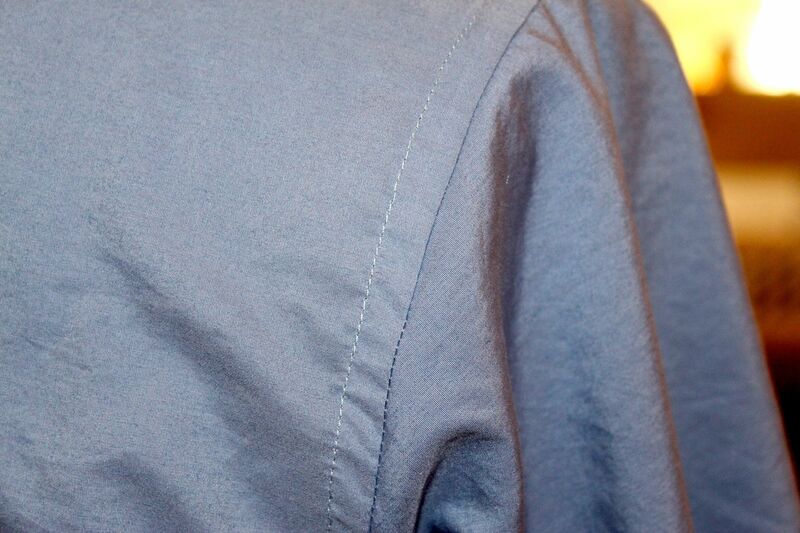 This seam looks good both inside and out, although I may lengthen the stitch when I make my husband’s shirt. With all the files out on the Internet for purchase, the options are limitless for enhancing a garment with machine embroidery. 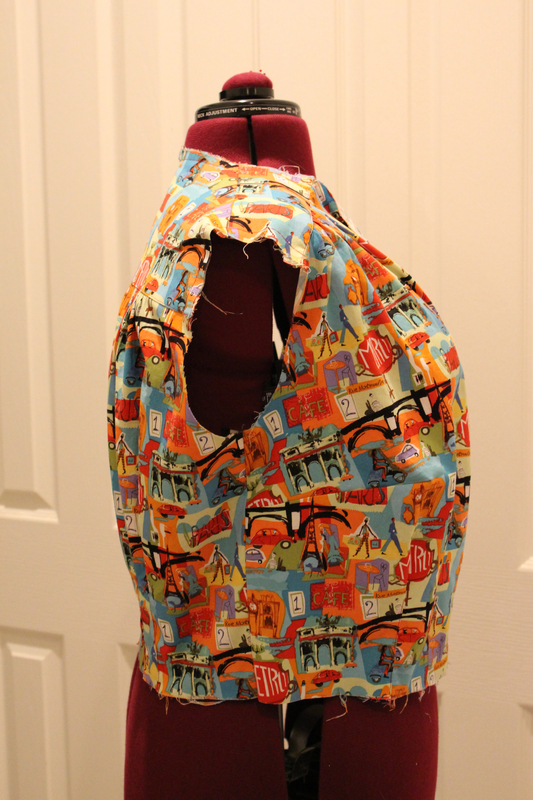 So that is the sad story of my attempt to make Sew Liberated’s Schoolhouse Tunic. But I’m very excited for my next sewing project. And since it’s a different version of a pattern I’ve already successfully fitted, it should be a winner. Note: Sew Liberated was kind enough to offer me a free pattern after I made their Clara Dress, which I love. I chose the Schoolhouse Tunic, and all the opinions here are mine. 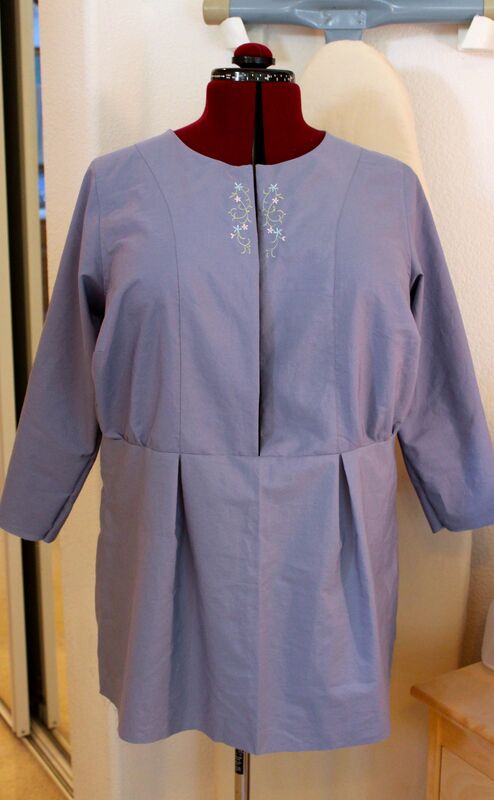 The Sewaholic line of patterns is specifically designed to fit and flatter pear-shaped woman. I am pretty much the opposite of a pear-shaped woman. My bust is my largest measurement, then my hips, with my waist not much smaller. But the great results a variety of women are getting from the Belcarra Blouse pattern looked too good to resist, so I jumped in the fray. Then came the pattern adjustments. I marked my bust point, then made slashes typical of full-bust adjustments, so I could see how much room to add. For a typical full bust adjustment, width is added across the bust, length is added to the center front, and a dart is added to the side. After trying that on, I realized that the bust point needed to be raised. I guess this is pretty common. The way the full-bust adjustment is done ends up creating a dart that does NOT point toward the apex of the bust. You often have to move it, but it’s impossible to know exactly how much to move it until you’ve done the adjustment. 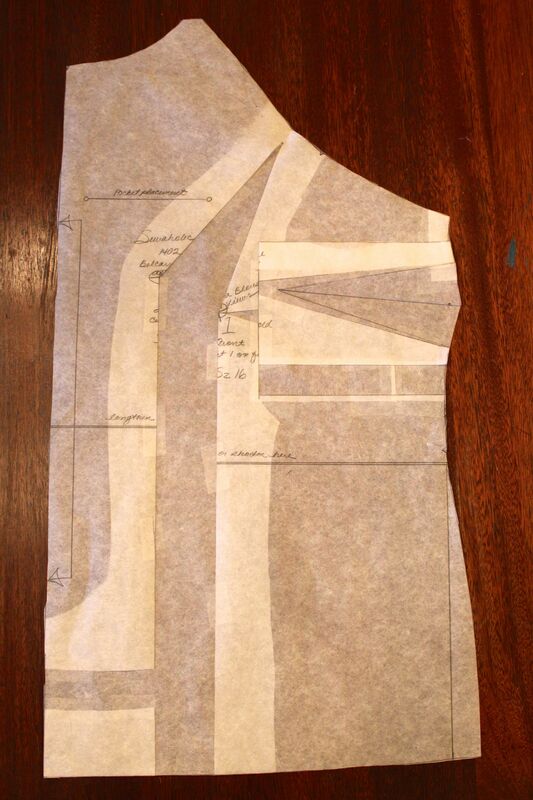 From this pattern alteration, I cut a new front bodice piece and replaced the slashed one. As you can see, the muslin fits Gene much better. However, the bust dart needed to be adjusted and the hips are way too wide. I have them pinned in an inch on each side, for a total of four inches. To accommodate these changes, I altered the pattern again. Here, I raised the bust point, then narrowed the hips. I almost made them straight but settled on a gentle curve. Now, I think I’m ready to cut out my fashion fabric. Taking a simple blouse pattern made for a pear and altering it for an apple is a lot of effort, but I think it’s going to be worth it. 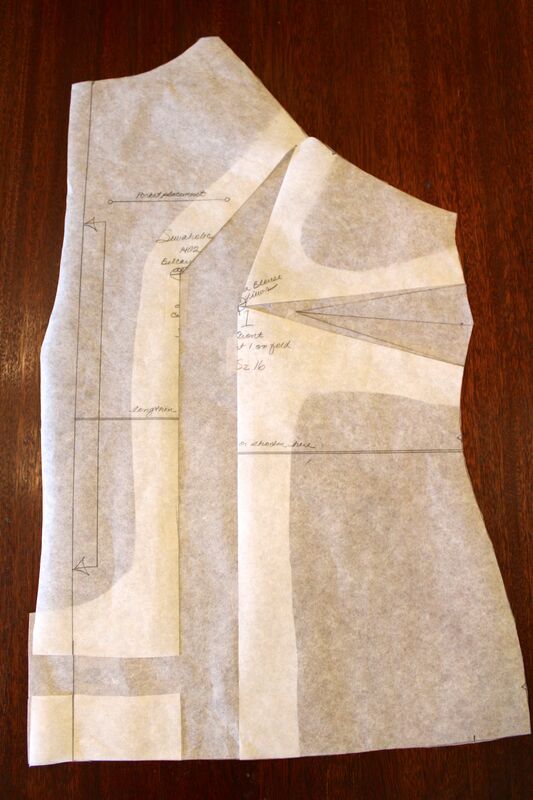 I had forgotten how nicely raglan sleeves sit on my shoulders, and this is a quick basic pattern. 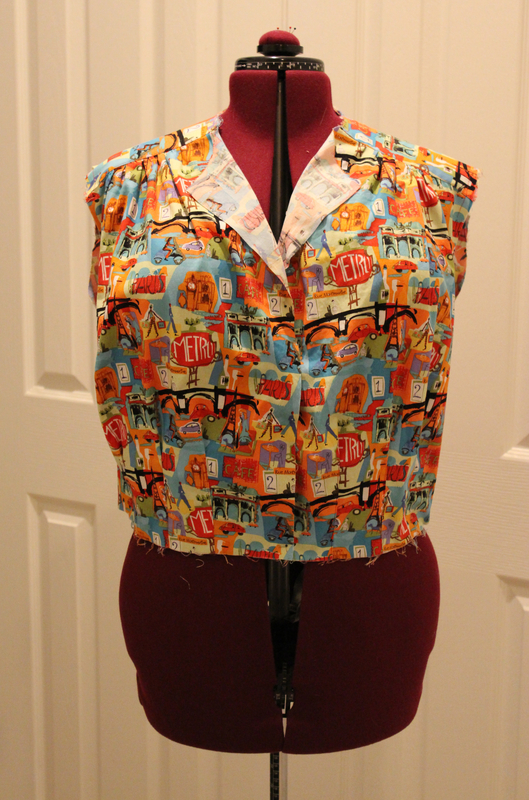 Once I have this pattern perfected, I can sew up a bunch of these basic tops. I’m hoping they will make a good substitute for the cheap knit tops I always buy at Target. 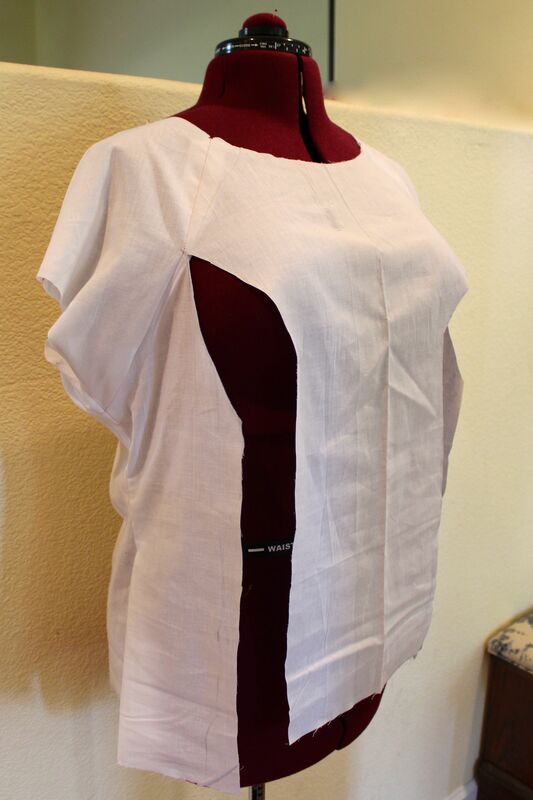 The Paris wearable muslin has turned into quite a project unto itself. I was mainly concerned with the fit of the bodice because I had made some crazy alterations to the pattern I was not at all sure would work. But they seemed to do what I wanted them to do. The original muslin. See the gap at the front edges? The center fronts are even further apart. The renovated front looks good! The only issue is the stiffness of the quilt-weight fabric. I did not even attempt to match the pattern across the front. That would have been crazy, particularly for an experiment. The back fit me just fine except for being too short. My dress form can’t expand to my back length. The back is unchanged except I made it an inch longer. It looks too long here, but isn’t on me. The side view shows that it rides up in front because it needs more length. Aha! The waist seam is horizontal, and the length is just where it needs to be. Once I was sure the changes to the bodice were working, I altered the front skirt pattern and went to cut out the rest of the pattern pieces. I had enough fabric according to the pattern requirements, but I hadn’t used the suggested pattern layout because I just cut out the bodice pieces at first. Turns out, the front facing wouldn’t fit. 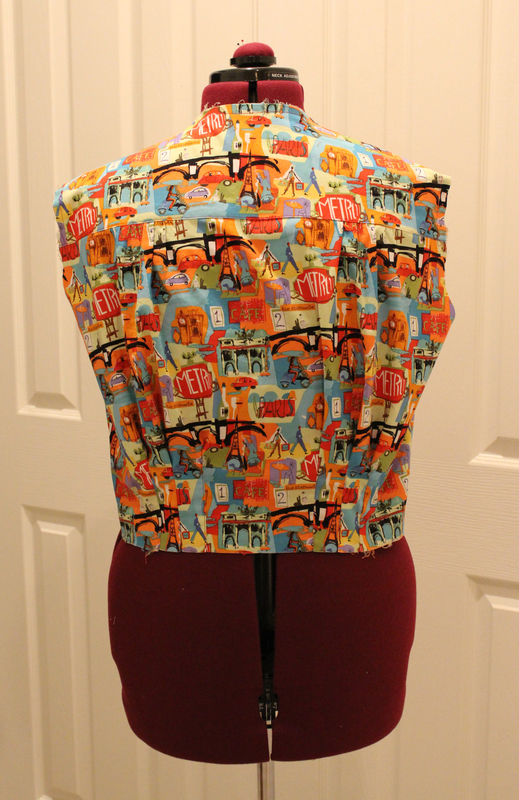 I could have cut it cross grain and pieced it, but this fabric is directional. 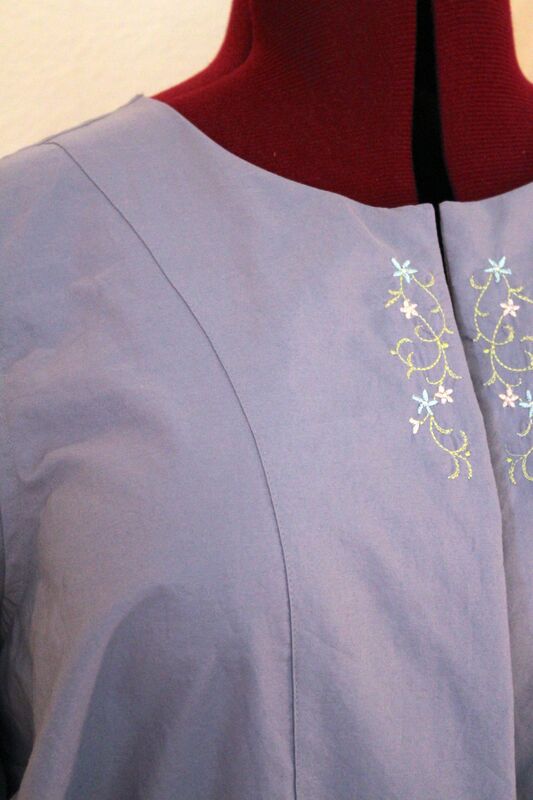 One of the pattern views shows a contrasting collar and front facing, so some white sateen that was in my stash is currently in the dryer. 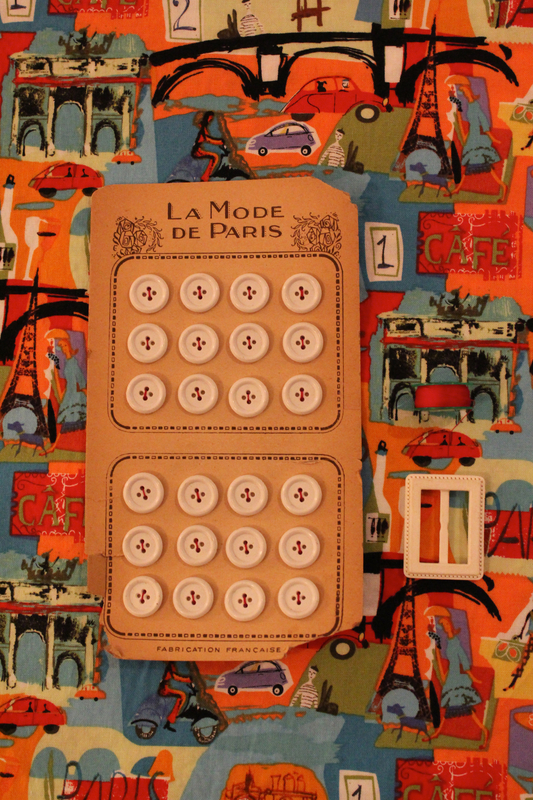 There’s the Paris fabric, plus buttons and a buckle, all from my stash. The only purchase I had to make for this muslin was red thread. I think the white accents will really pop on the fabric and calm it all down. You can see why I decided on red thread. The buttons were sewn to the card with red thread, and I thought the look would be perfect. 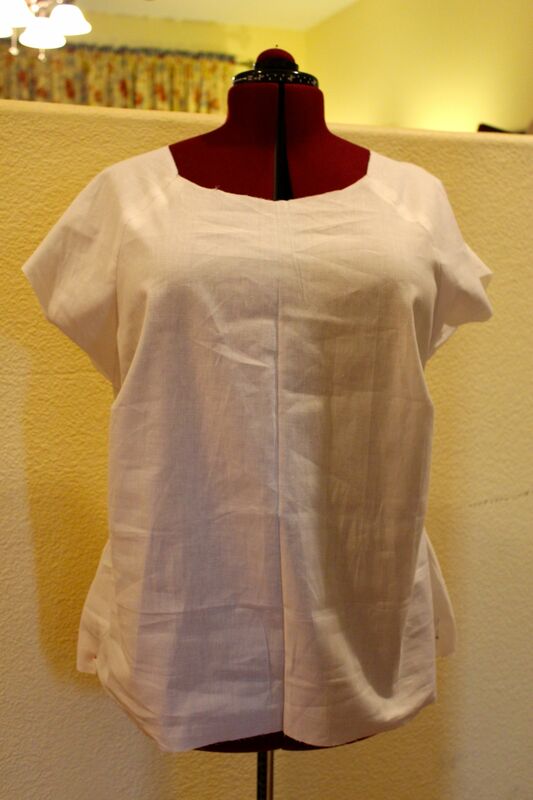 This is an awful lot of effort for a wearable muslin, but it looks like it’s working. It should be really nice once I make it in the pretty teal and navy lawn. If I don’t run out of inspiration before I get there!